Fall (or Autumn) is my favorite season for so many reasons. The season makes me feel welcomed and comfortable. The cooler air, the wind, the beautiful colors of the trees, the opportunity to wear scarfs, flannel, boots, and of course more excuses to cook and bake. And the smells are warm and inviting (who doesn’t like cinnamon and cloves?). 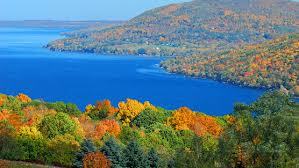 This is our first time experiencing fall here in New York and I more than a little excited, mainly because upstate New York, especially the region we live in, is know for a beautiful fall foliage. The trees are starting to slowly turn, I will see glimpses of yellow or orange here or there. 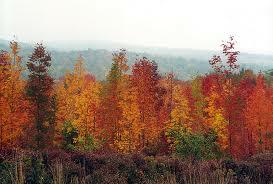 I can’t wait to go on some beautiful drives and hikes in the colorful trees. Other hints towards fall are less inviting, because of the cooling weather we have an increase in spiders. 😦 After a few bites we discovered it is typical for East Coasters to spray their houses down when fall hits. 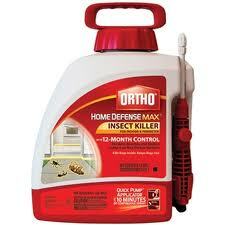 So we bought some Ortho home defense and coated the outside of our house before the problem got any worse. Since then we have been bug free (let’s hope it stays that way). I am looking forward to corn mazes, pumpkin patches and carving, and autumn flavors. 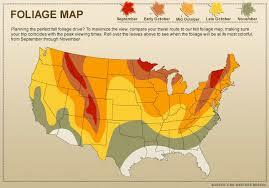 (I have already looked up the closest pumpkin patches and corn maizes in the area). Speaking of flavors I have also jumped started the season with some pumpkin spice coffee mix and granola. (Hopefully this will keep me from ordering sugary drinks out). 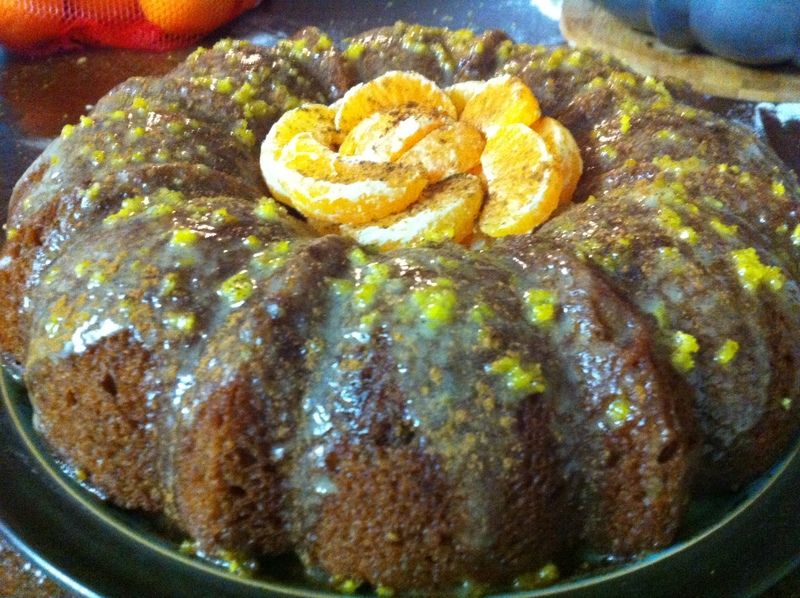 Labor day weekend I made an orange spice cake that fit perfectly into the transition of seasons. 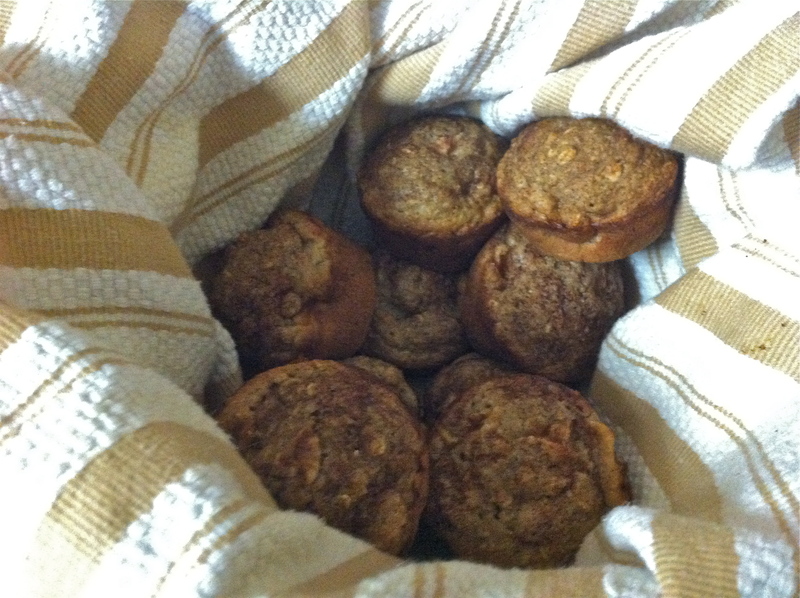 This week I also tried out a new recipe for cinnamon oat apple muffins. 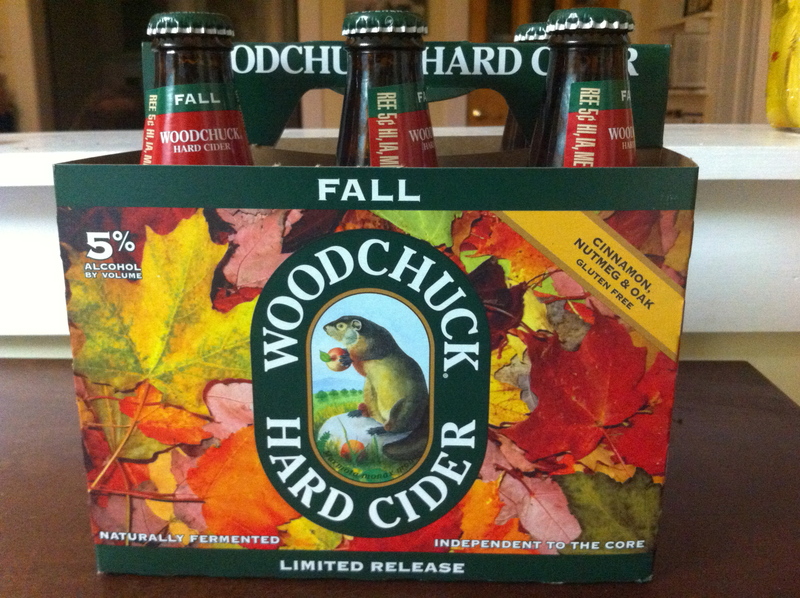 Then finally this past weekend when I went to the store I found my favorite hard cider: Woodchuck’s limited release Fall. It taste just like an apple pie! 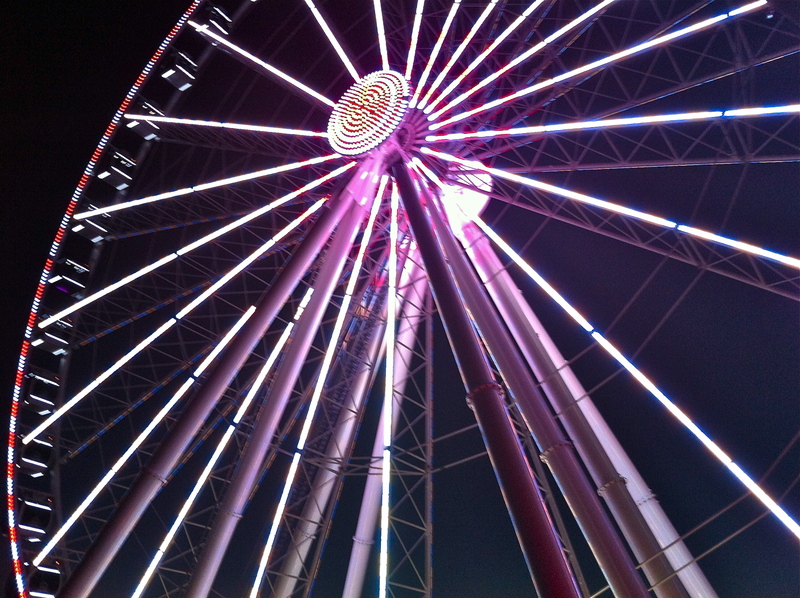 It also brings back memories of our honeymoon last October eating Gluten-Free pizza and drinking hard cider while enjoying our rainy beach-front view. 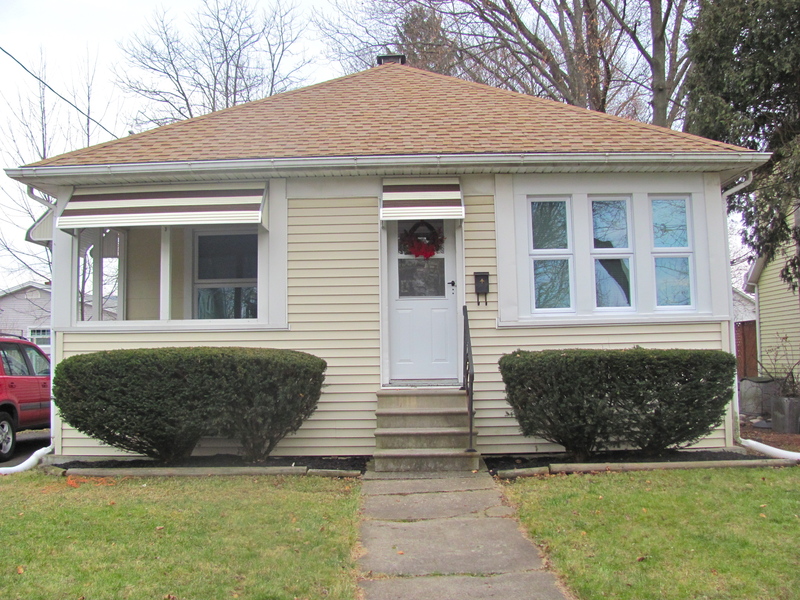 In addition to this, I bought a wreath for the front door on sale (before all the season’s crafts were turned over to Christmas!). 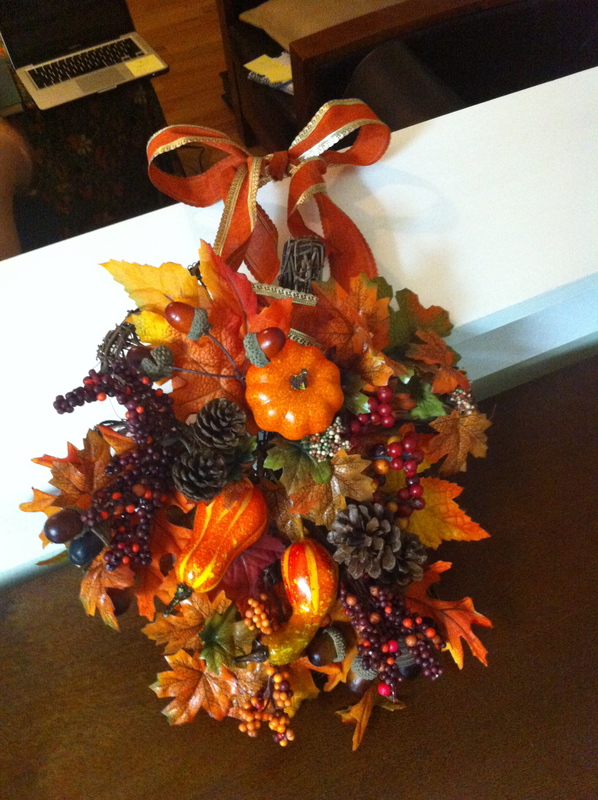 It started off a little bare but with a few extra wire wrapped leaves and berries I was able to make it a full autumn bouqet. Using orange and gold wire wrapped ribbon, I tied the broadest ends of the twine leaf shape together and tied off a bow. 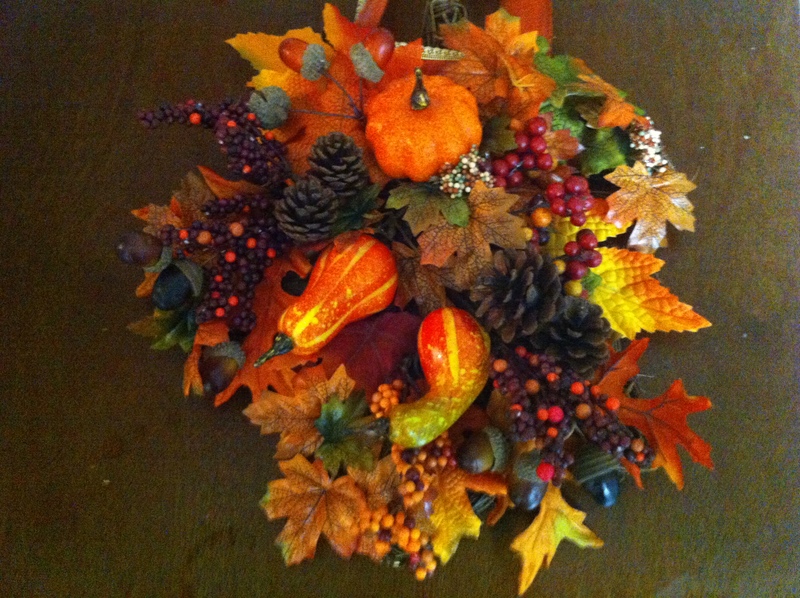 I’m waiting to see other autumn wreaths on my neighbor’s doors before hanging mine. 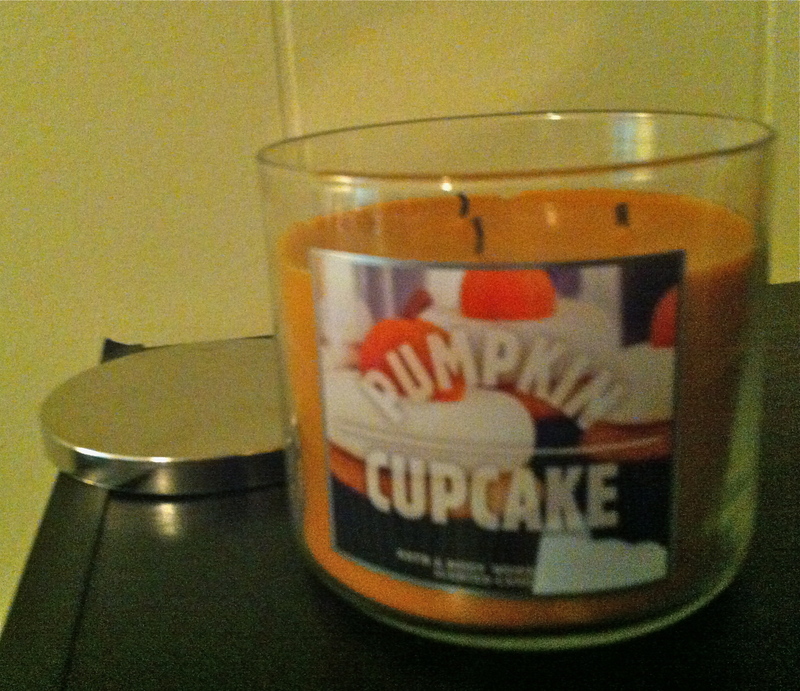 This past weekend we took a rare trip to the mall and I bought a pumpkin candle I plan to use every fall. It’s labeled pumpkin cupcake but to me it smells like something is pumpkin flavored is baking in the house a very similar to when I make my family’s pumpkin bread. 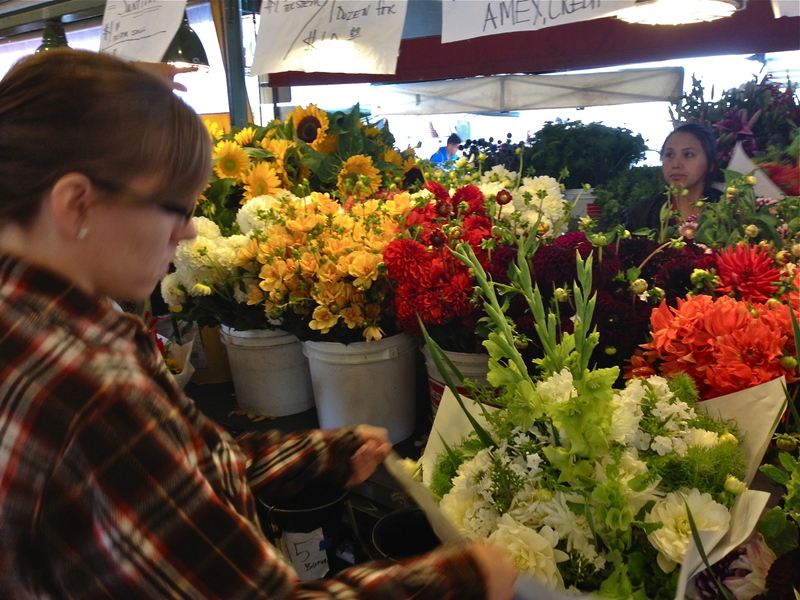 This is also the time of year that people begin to persevere summer produce. Jars of jam and pickled foods are popping up everywhere. Someone at Luke’s work found out he is a big fan of pickles. Next thing I know he came home with a cardboard box filled with mason jars of pickles seasoned and prepared in a large variety of ways. Alongside the preserved pickles came a small jar of grape jelly (one of Luke’s favorite fruit flavors). 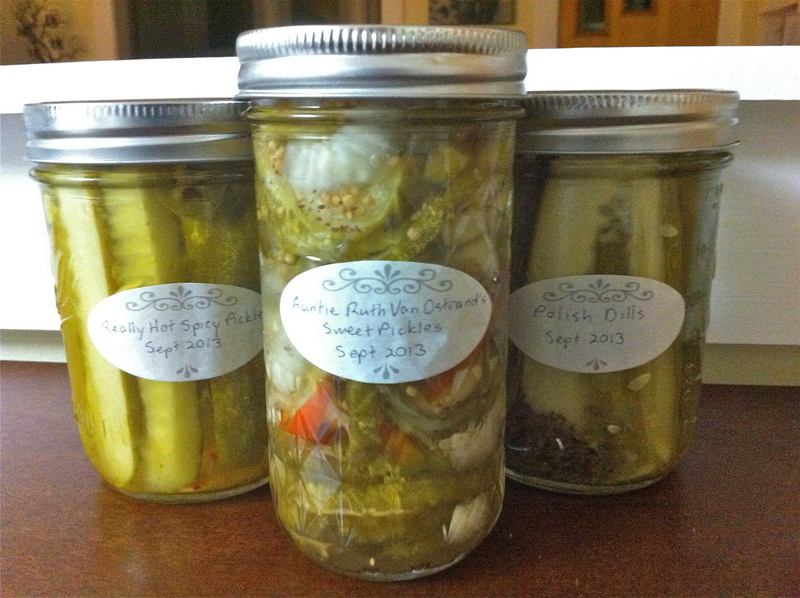 We also have begun preserving produce. 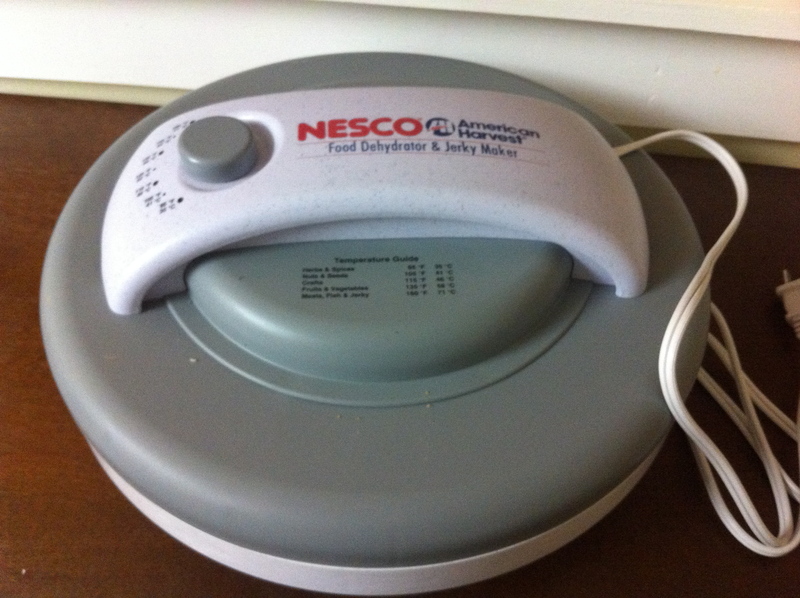 This past week we finally started using the dehydrator bought for our us from our wedding registry to make fruit leathers/roll ups. 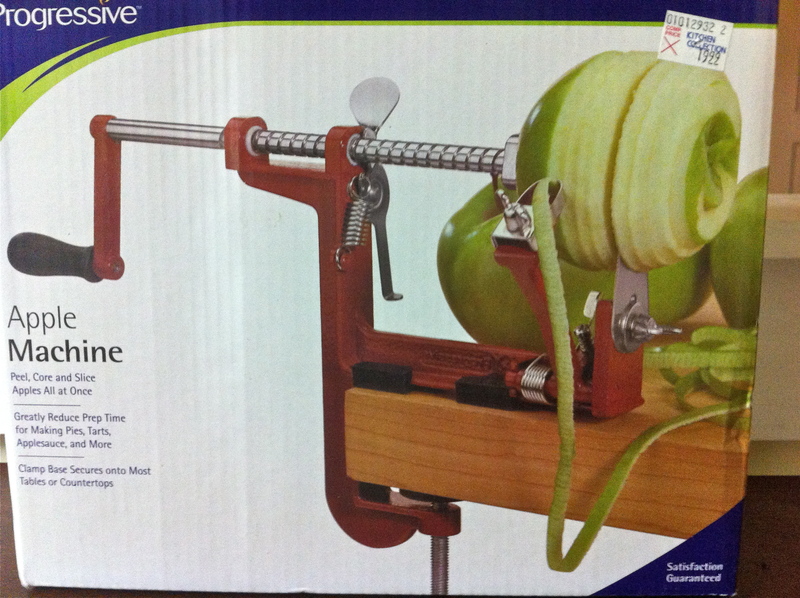 We even picked up and an apple corer-peeler and a few extra trays for the dehydrator so now we are ready to make apple chips, pie, or roll-ups/ fall fruit leathers. Of course also with the change of the season I changed out my holiday tree. 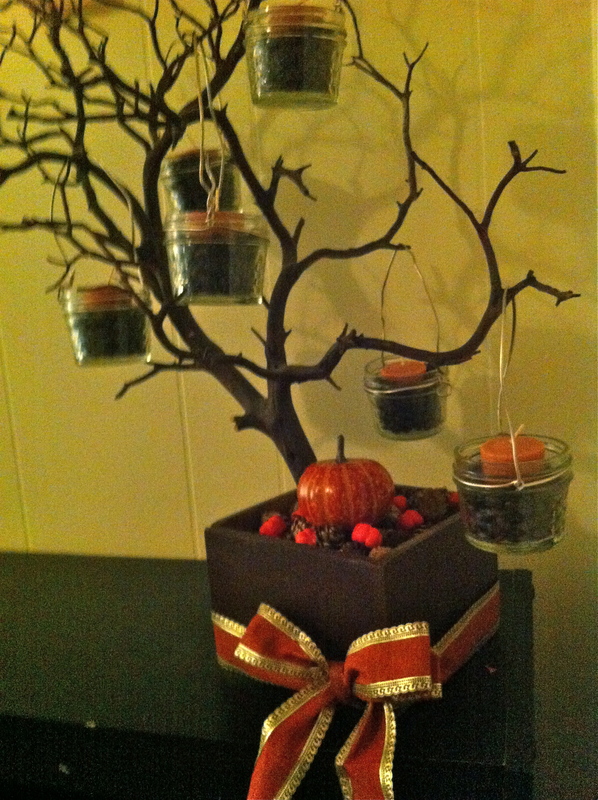 (Don’t know what I’m talking about then see Holidays grow on Trees) I filled the small mason jars with a dark roast coffee beans then placed votive pumpkin candles in the centers. 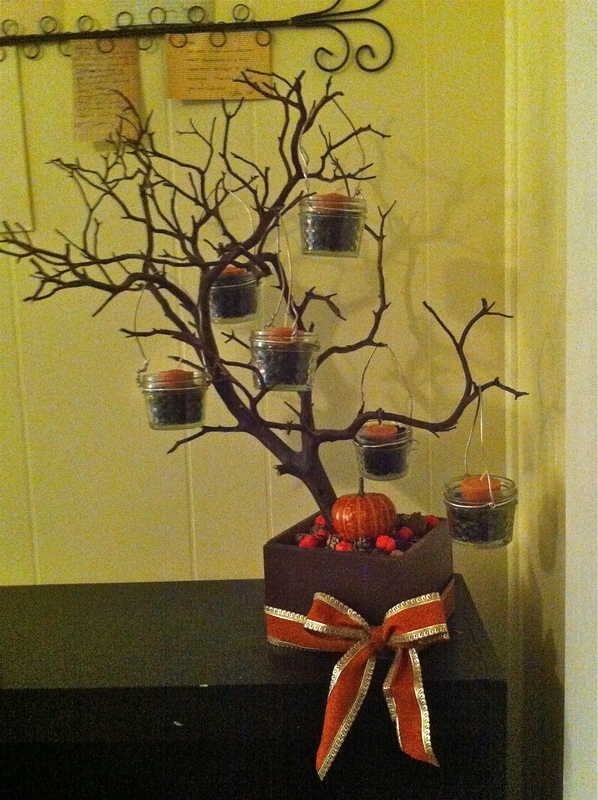 The base of the tree is filled with small pinecones and pumpkin shapes. 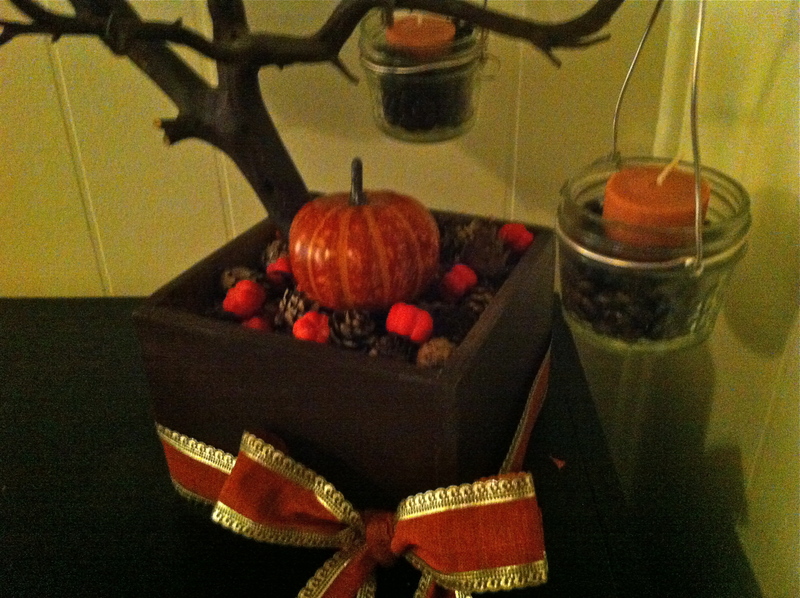 I also picked up a plastic pumpkin to stick in the pine cone base. 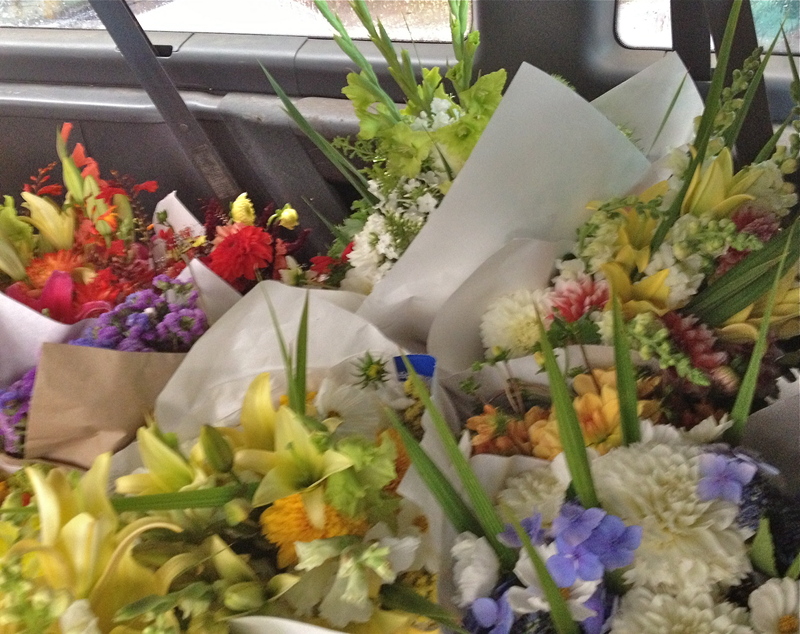 Then I tied it all off with a beautiful wire rapped ribbon in orange and gold. 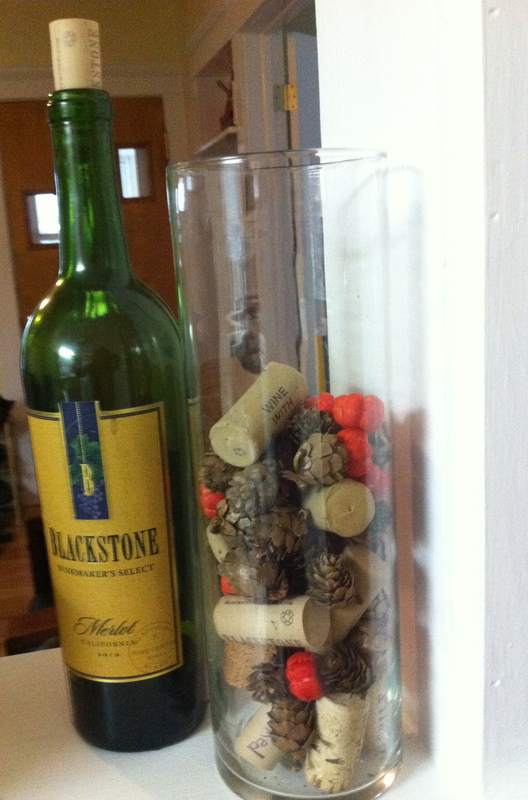 The extra base filling I added into the vase where I’ve been displaying/storing our wine corks. What are your favorite fall activities? 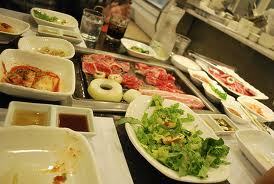 Flavors/Foods? 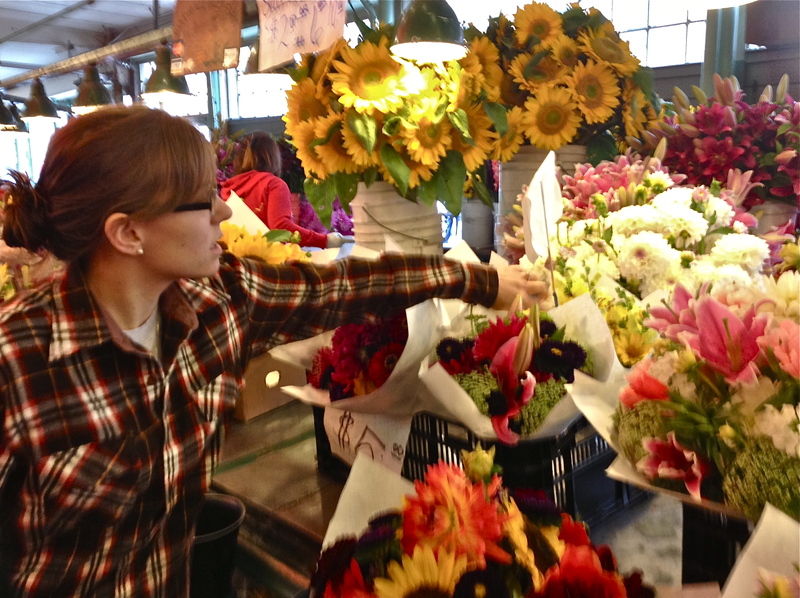 Last week at this time I was rushing around Pikes Place in the Emerald City. 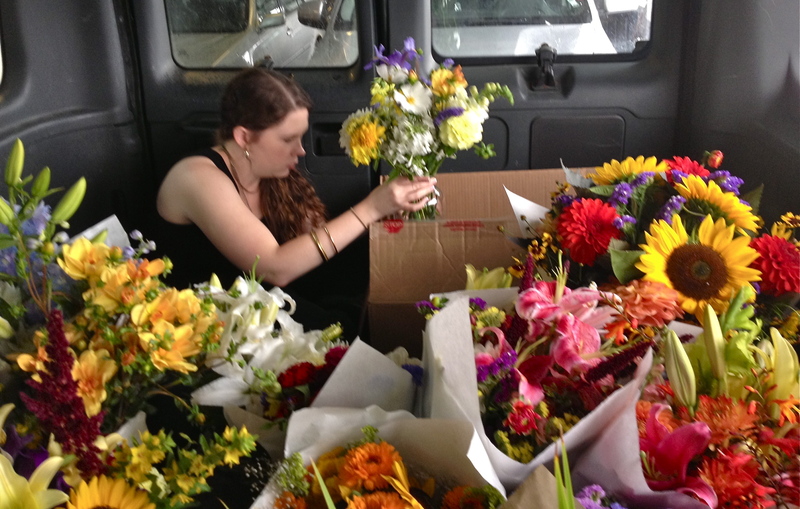 Dodging around Seattle tourists, I tried to find the perfect bouquets to decorate the ceremony and reception space for my brother’s wedding. 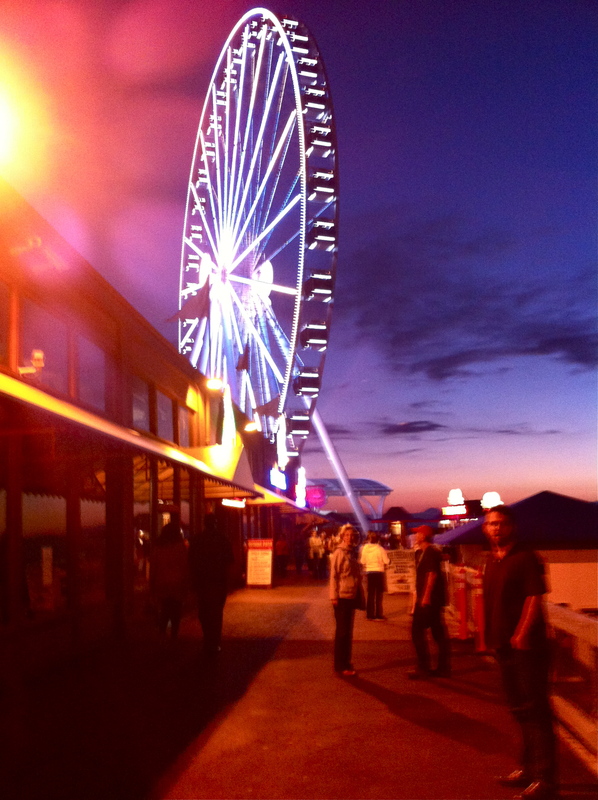 It had been a year and a half since I had gotten the chance to see my favorite American city. Luke and I had visited friends/family in Oregon and Washington during New Years break in 2012. It was the first time Luke had seen me in such familiar and comfortable territory. 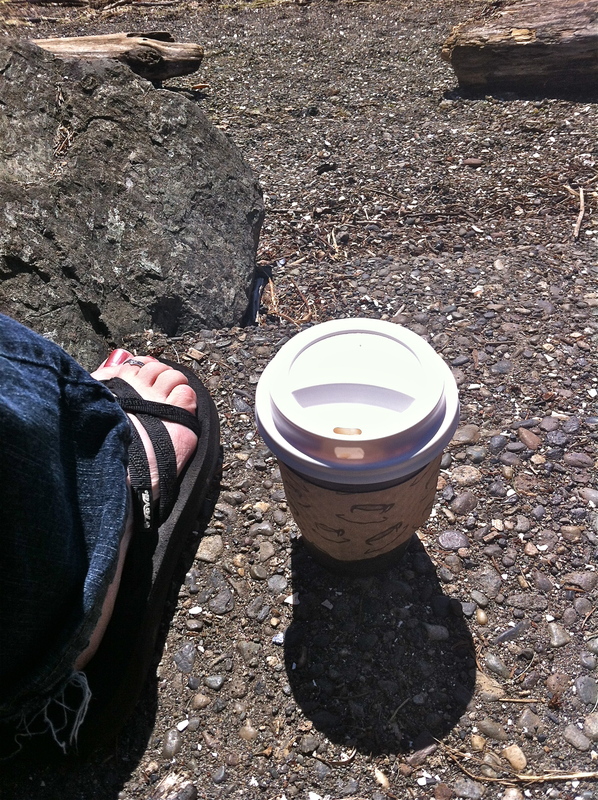 I was giddy to return to the rainy, green, and coffee obsessed state where I went to college. 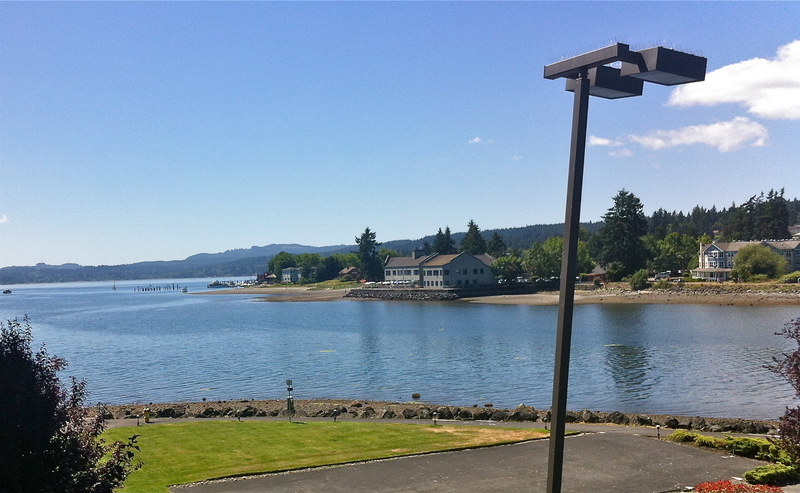 Two weeks ago late night I joined my parents at the Best Western in Silverdale. Exhausted and jet-lagged the next day my mom and I went down to the espresso bar in the hotel lobby. I boldly asked for a 12 oz. nonfat double shot cappuccino and almost cried with happiness when she asked if I wanted it wet or dry. I told her I loved that she asked me- and without understanding my burnt espresso experiences , she just gave me an odd look. I realize I am a coffee snob and I do not trust any other state to get a cappuccino right (but more on my coffee obsession later). 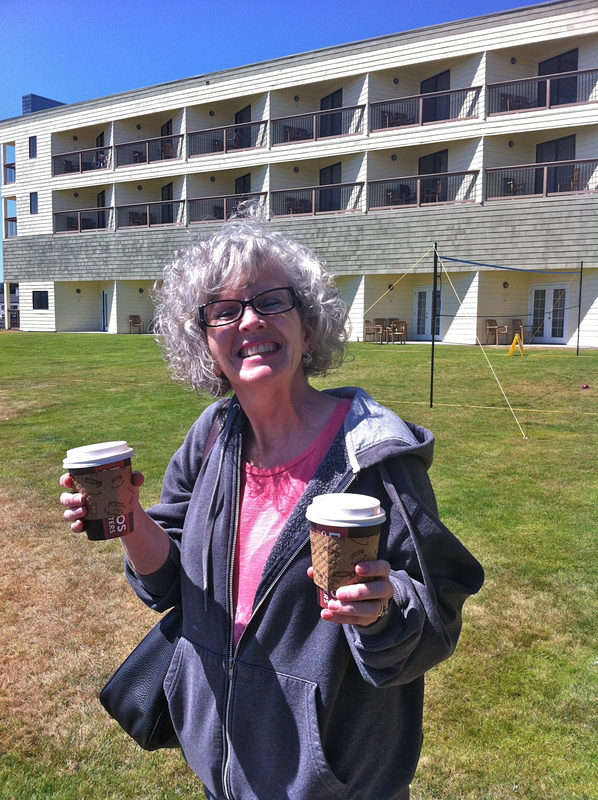 My mom and I enjoyed the bay view sipping on our coffee trying to regroup for the bridal shower that night. 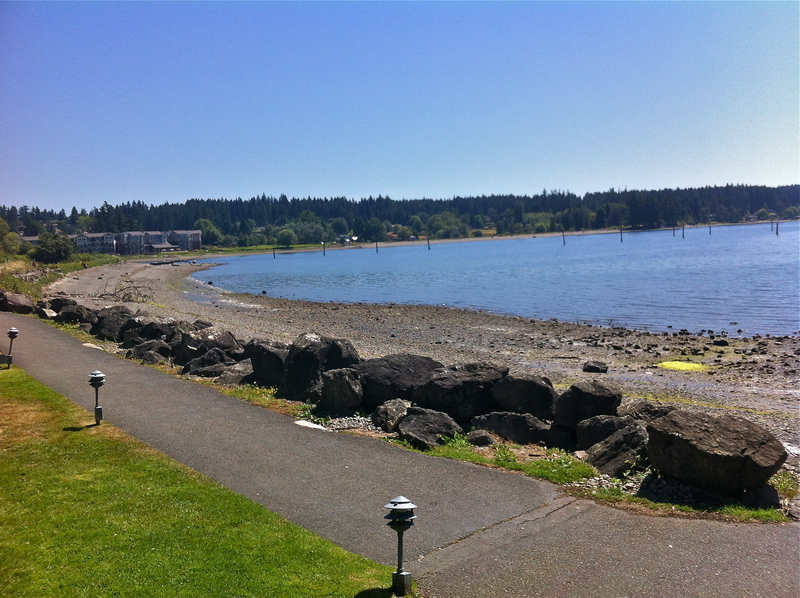 As I sat there I remember why I love this state: surrounded by bays, lakes, and the ocean year-round there is greenery in site ( it is called the evergreen state after all.) The sunny days are deeply cherished just as the rain and cloudy days an accepted norm. 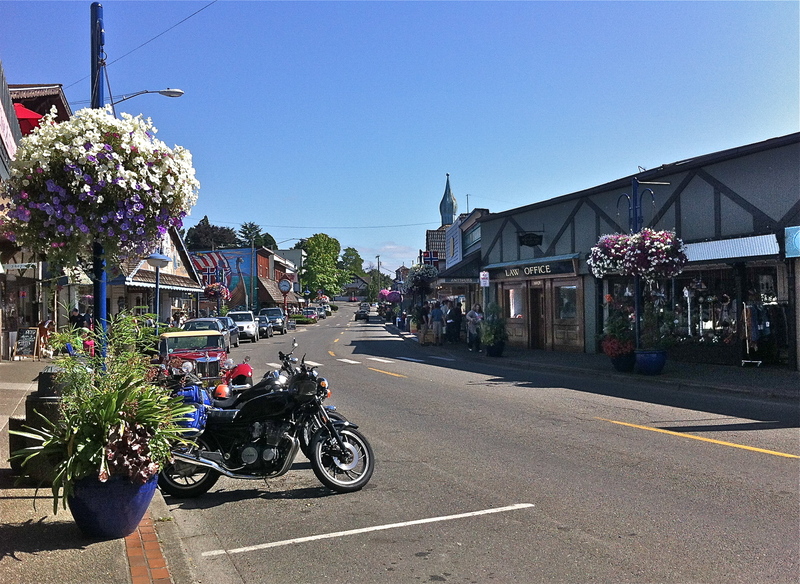 We spent most of our time in a little town called Poulsbo. 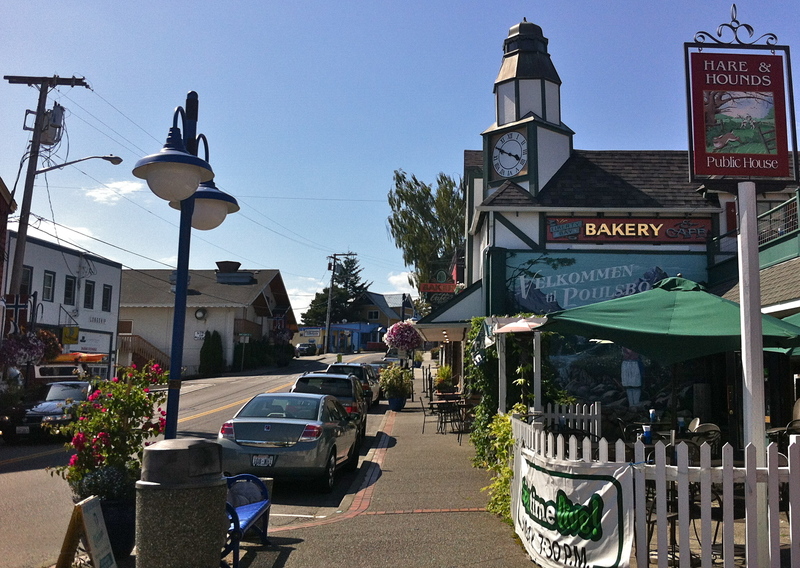 This quaint country-like town is considered a little Norway. Years ago, immigrants from Scandinavia settled here because the weather and geography reminded them of the fjords in the old country. 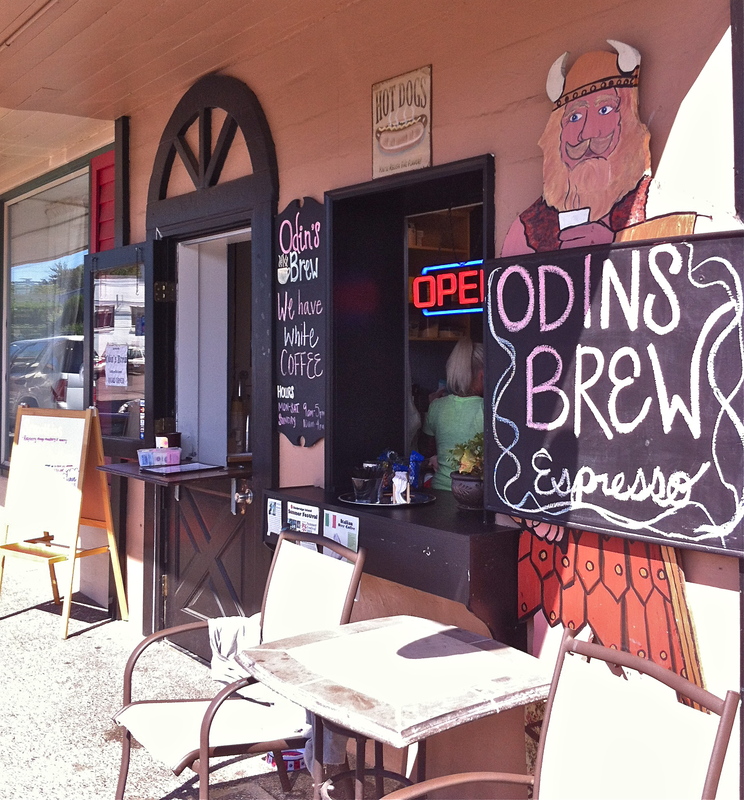 Front street downtown Poulsbo hosts a variety of Scandinavian treats and souvenirs awaiting the summer tourist. 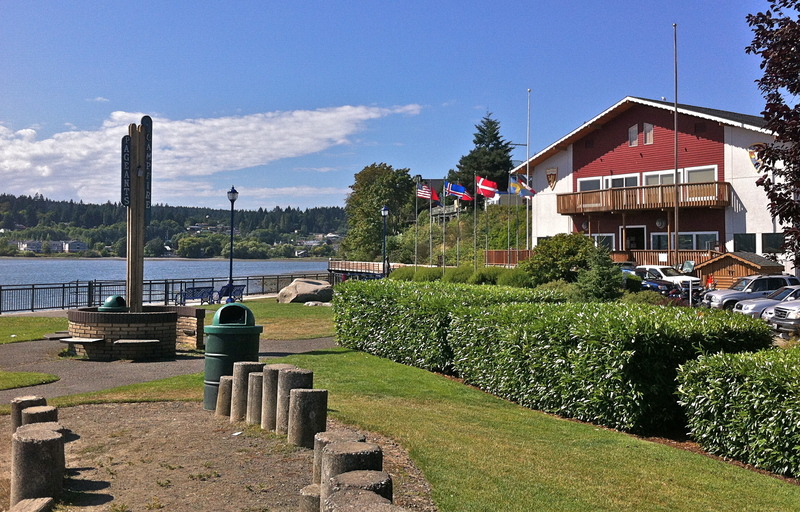 This was not my first time to Poulsbo, visiting both in 2005 and 2009 during some vacations. 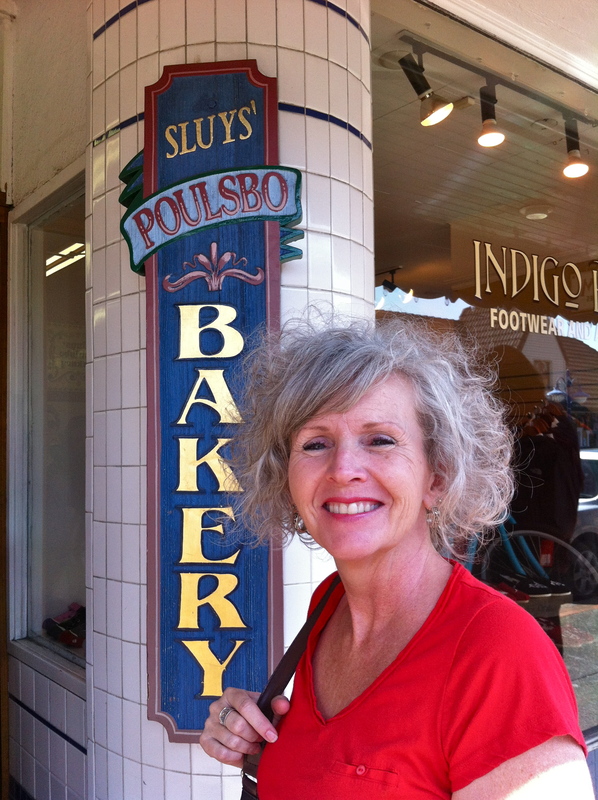 So in our limited spare time my parents and I stopped by Sluys the famous Scandinavian bakery in town. 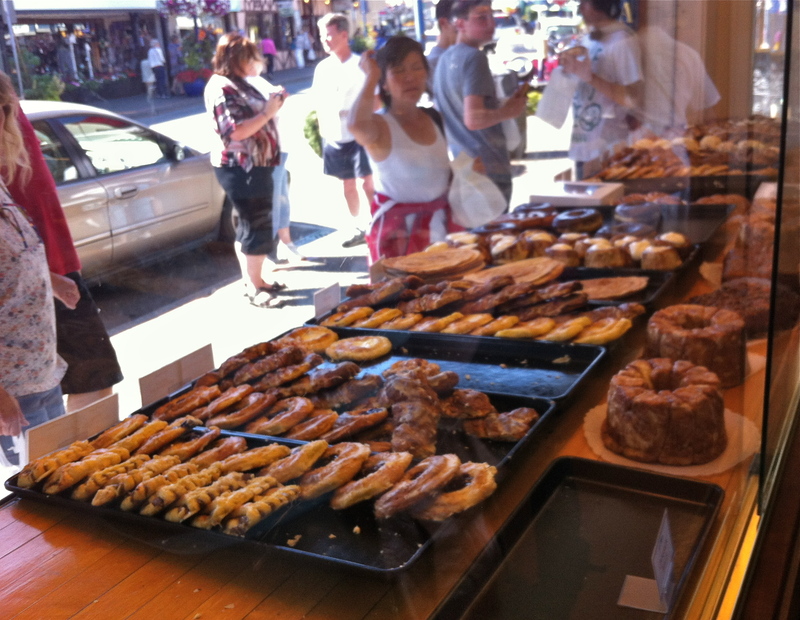 It storefront is easily spotted especially in the summer as the line is out the small front door. 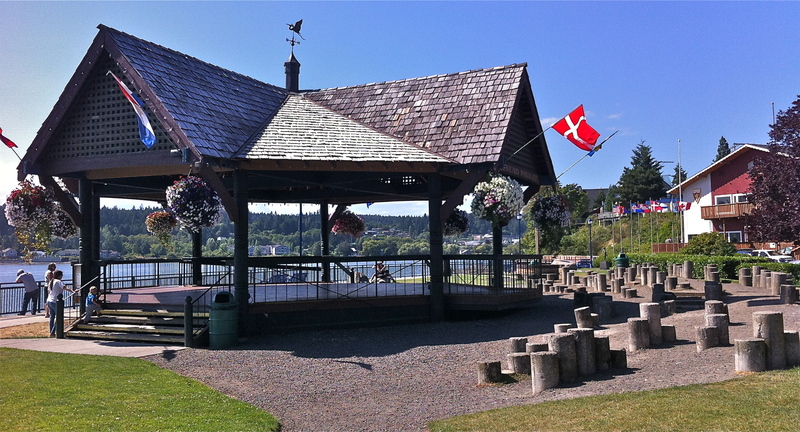 This little Norway hosts traditional winter and spring festivals such as Julefest and St. Hans Midsommer which is celebrated along the Liberty Bay waterfront. Here the local Sons of Norway chapter dedicates itself to preserve culture through annual events, traditional folk dancing performances and classes among other cultural arts. Stina and her family are Swedish/Norwegian and have grown up folk dancing and participating in the annual festivals downtown Poulsbo for years. 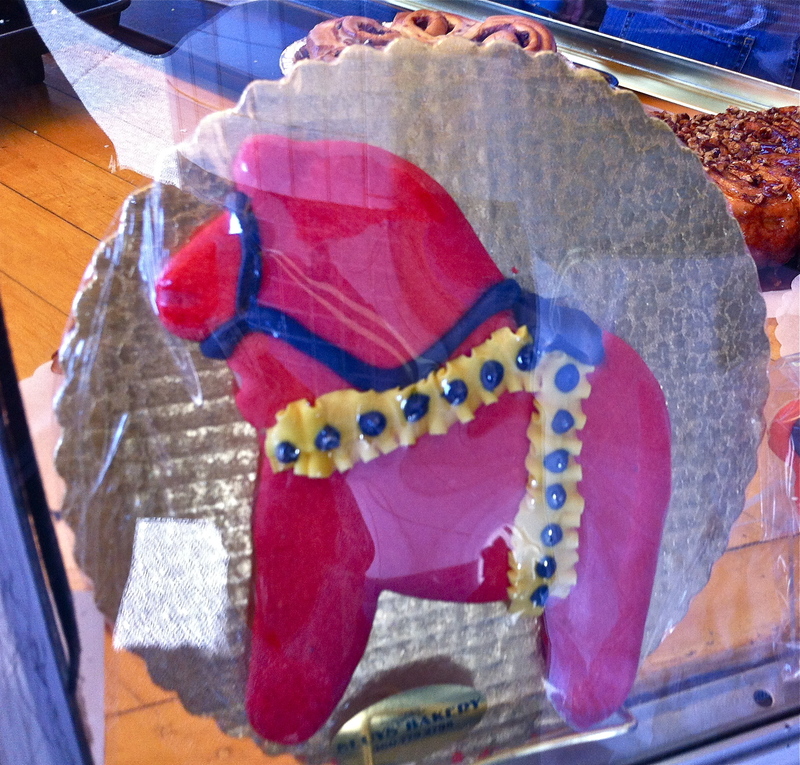 Within this past year my brother also has participated in the Scandinavian traditions. And appropriately so, although our family history includes many European ancestries my maiden last name is Norwegian and we can trace the Halvorson name all the way back to a farm in Norway. It was here at the Sons of Norway that the wedding reception was held and celebrated by traditional folk dancing (more on this to come). 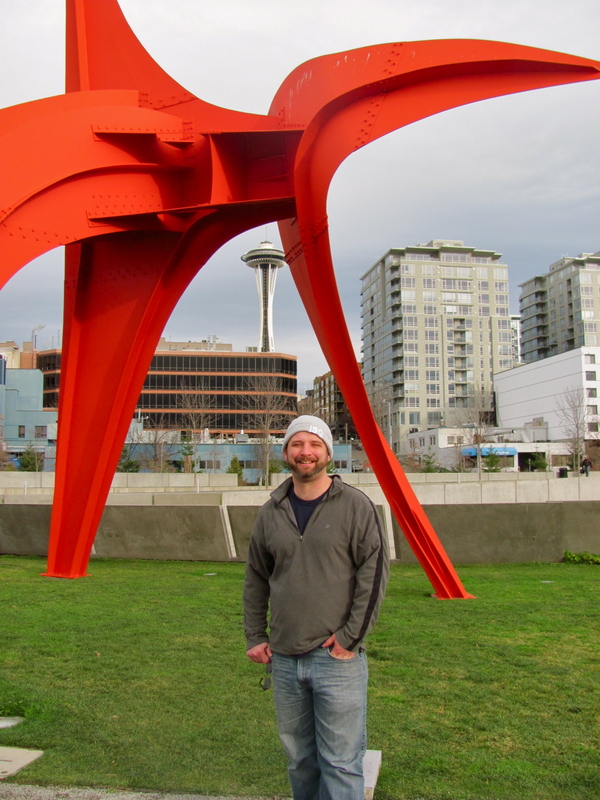 But as I mentioned earlier I did get to spend some time in the great city of Seattle. 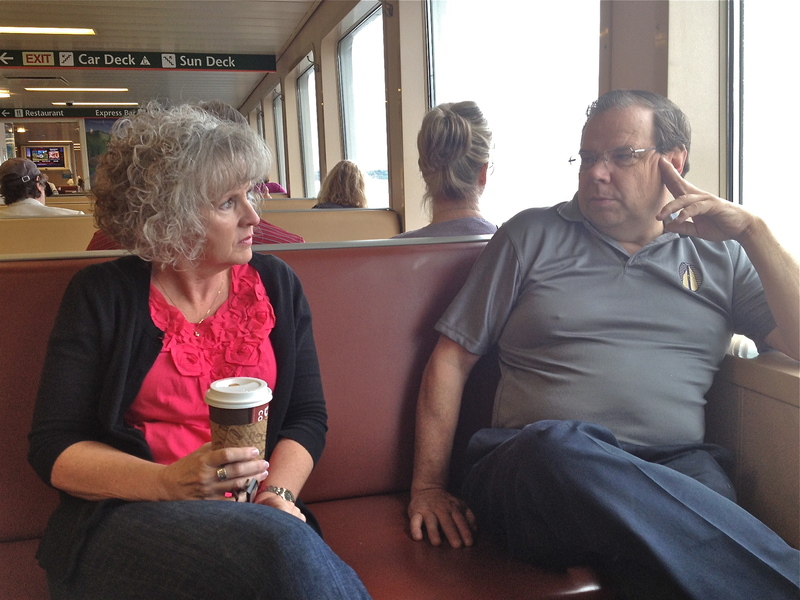 Taking the Bremerton hour long ferry on rehearsal day my mother, Stina, her father, and I sat and discussed our strategy for saving time and money on this flower-run. Meanwhile, we enjoyed the music of street-muscians warming up for a performance at Pikes Place. 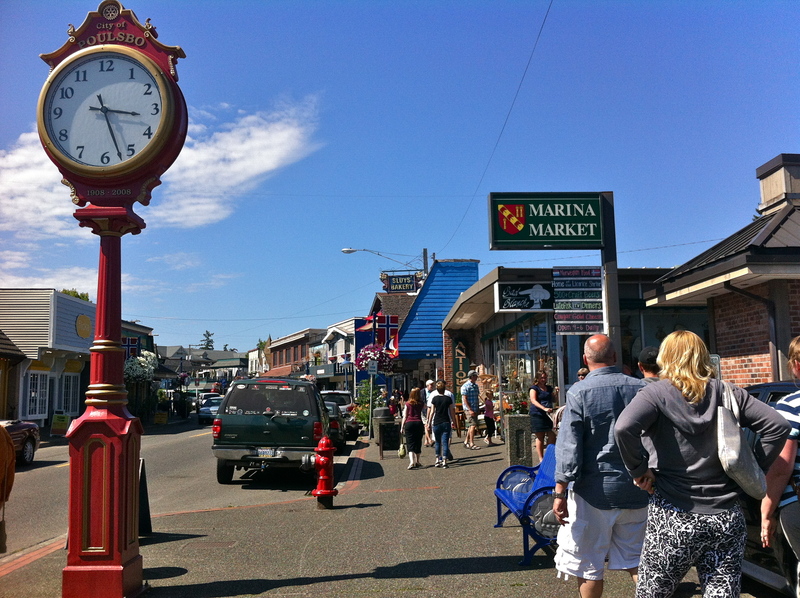 If you have never been to Pikes Place it is a multi leveled shopping experience filled with eclectic storefronts. 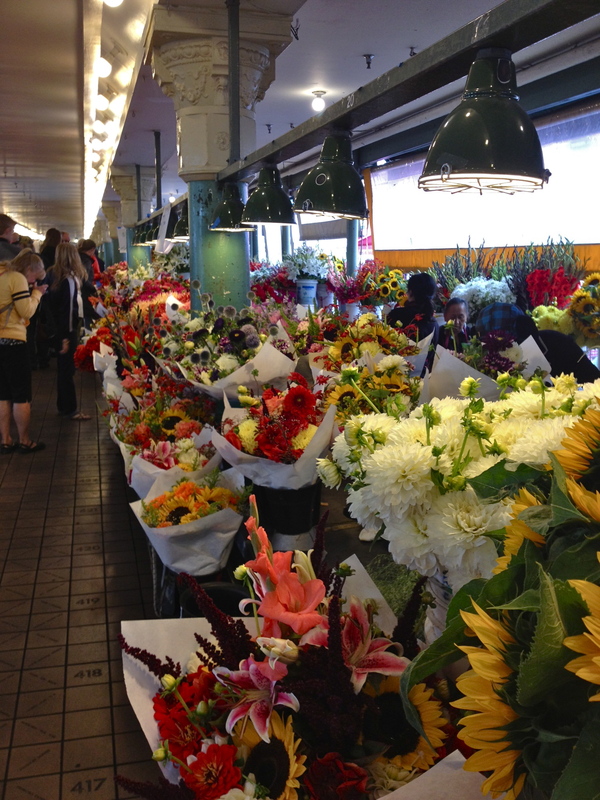 The top level hosts the famous semi-open market adjacent to the famous original Starbucks. 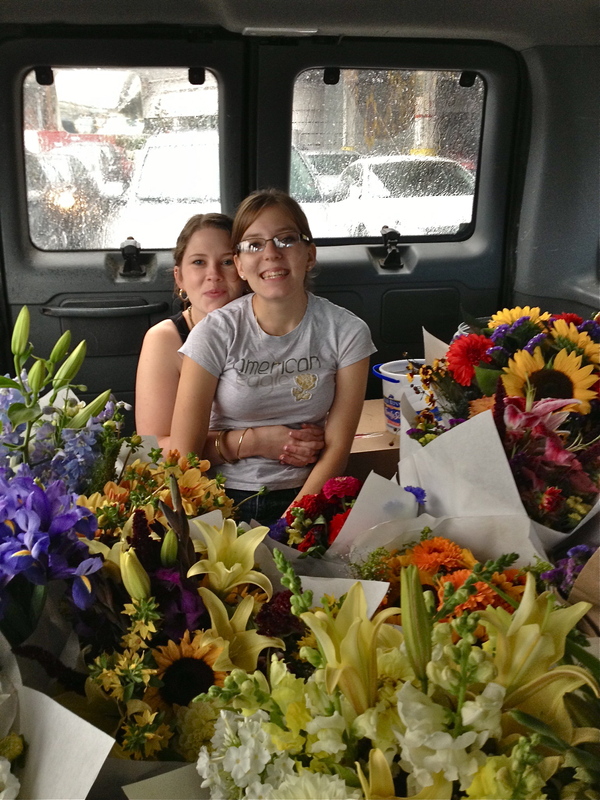 All along the right hand side of this top level are florists selling beautiful arrangements for 10 to 15 dollars a bundle. 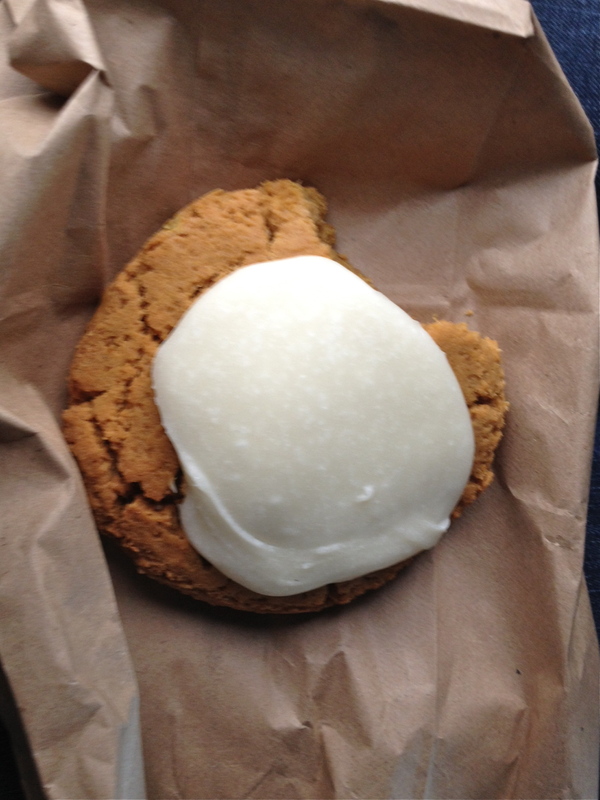 After gathering enough bouquets to fill the back of the van we took a snack break grabbing monster size gluten-free pumpkin cookies at a familiar storefront. By 11am we were back on the Bremerton ferry headed to Poulsbo. 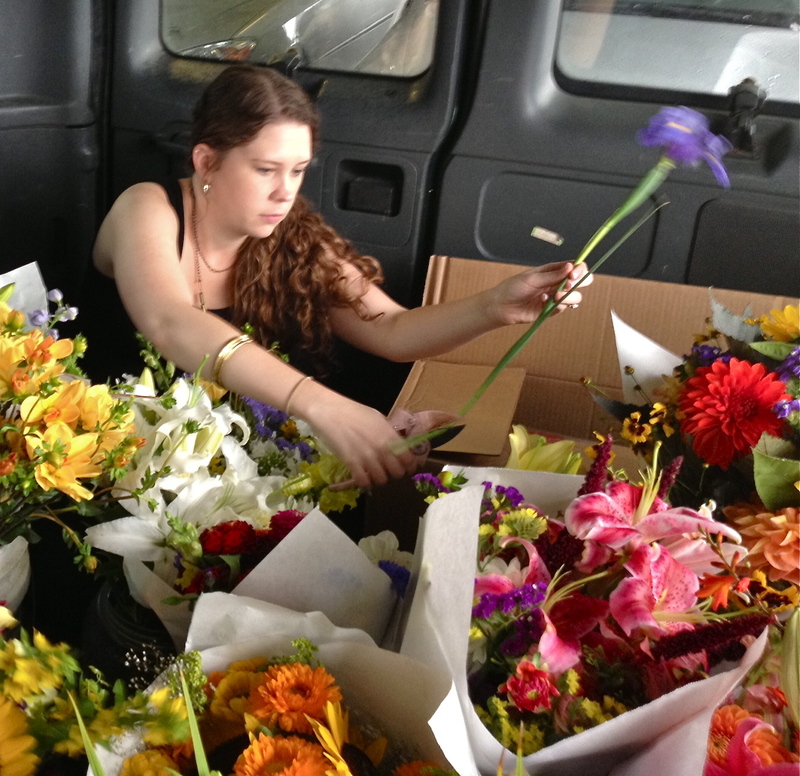 On the ferry ride I sat in the back organizing flowers and prepping a sample bouquet for centerpieces. The next day after the wedding reception and seeing the newly weds off Luke, my in-laws, and I packed up our bags and headed for the 7:55pm ferry to Bremerton. 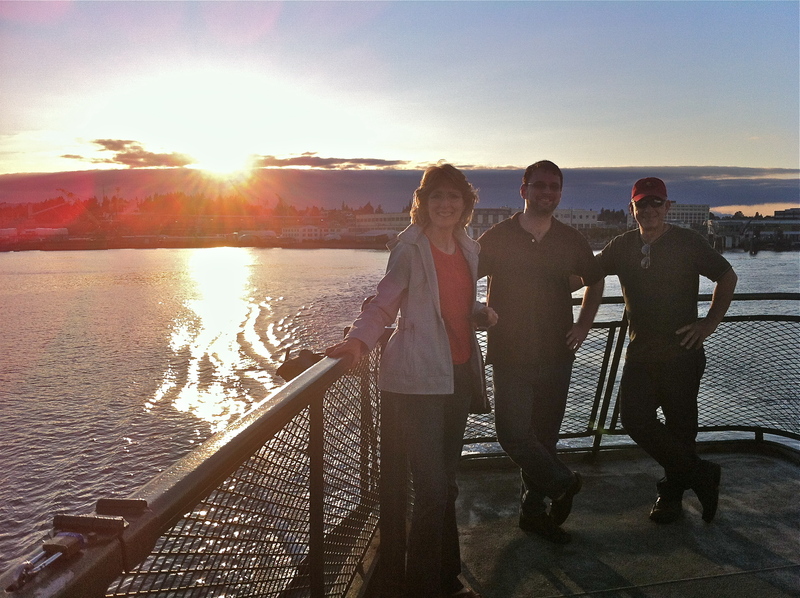 It was my first time on a Seattle ferry with Luke and it was beautiful as the sunset over the Emerald City. By the time we reached downtown the sun had set. We parked under the free-way and walked over to the pier boardwalk. 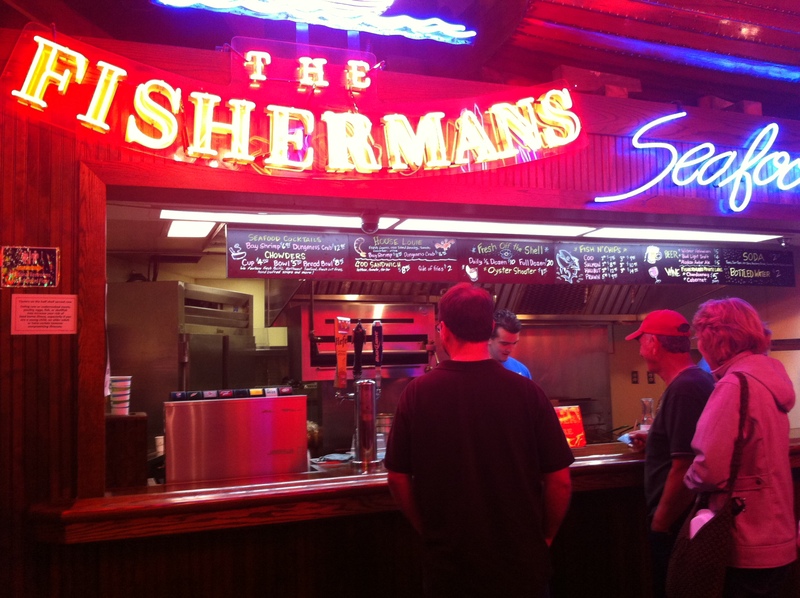 Finding a cheap fisherman stand, we got a late dinner of clam chowder and fish n’ chips. 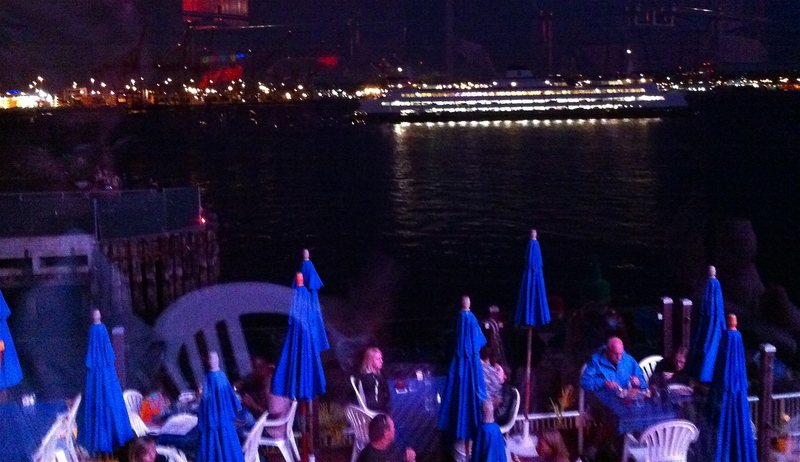 We found a spot to sit outside watching the ferries and the newest additon to the pier: The Great Wheel light up. As we walked around the pier and then back to the car my mother-in-law said the same thing Luke had more than a year ago: I was obviously back in familiar territory. As we curved past SAM park I directed my father-in-law up hill to the Queen Ann district to get gas before taking us to the airport. Passing right by the space needle we then headed to SEATAC for our red eye back to New York. I was sad to leave the northwest and friends and family behind but was so grateful for a weeks worth of great experiences with them in and near my favorite city. Luke sends me text or emails anytime there is an event at work in which I have the opportunity to provide some wonderful baked goodies. It is a great chance for me to try a new recipe but get rid of more than half of it before we are tempted to eat them all. A few weeks ago Luke’s department was having a retirement party. 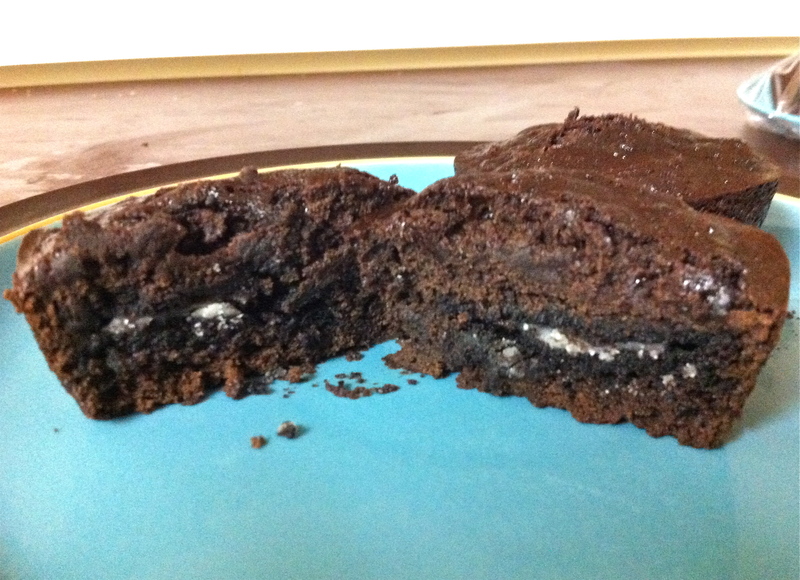 So I made up these delicious mocha Oreo cupcake brownies. 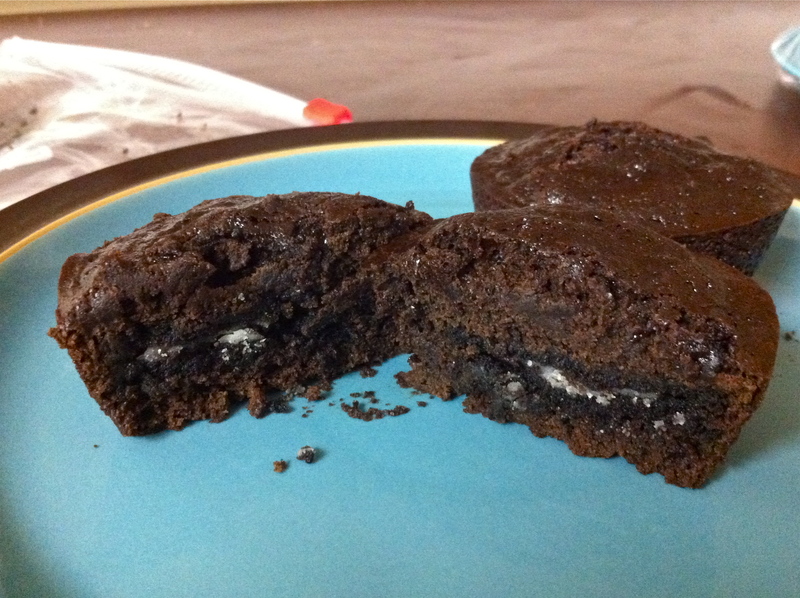 Based on the very popular pintrest pin, where some ingenious person placed two double stuffed Oreos, stuck together with peanut butter in a cupcake tin, covered it in brownie batter, then baked it. But as you know, I like to put my own twist on things: and a healthier one at that if I have the chance. 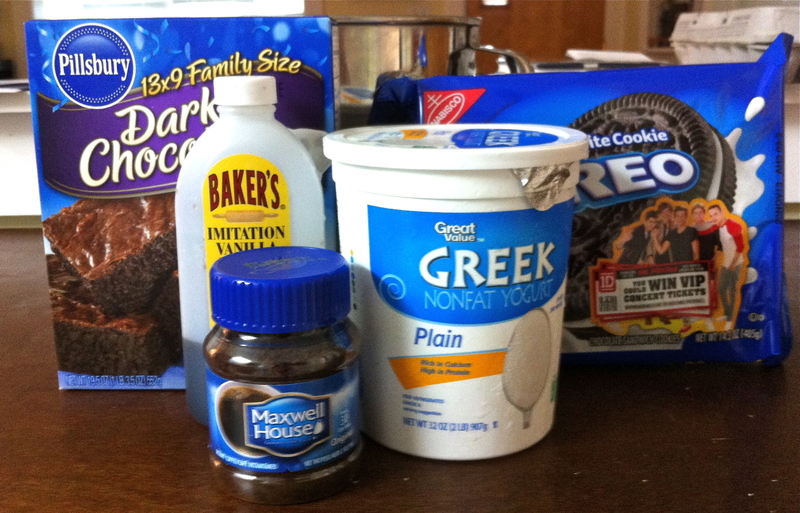 Using greek yogurt and only one Oreo (no peanut butter) one of these handheld chocolaty treats is only 160 calories. 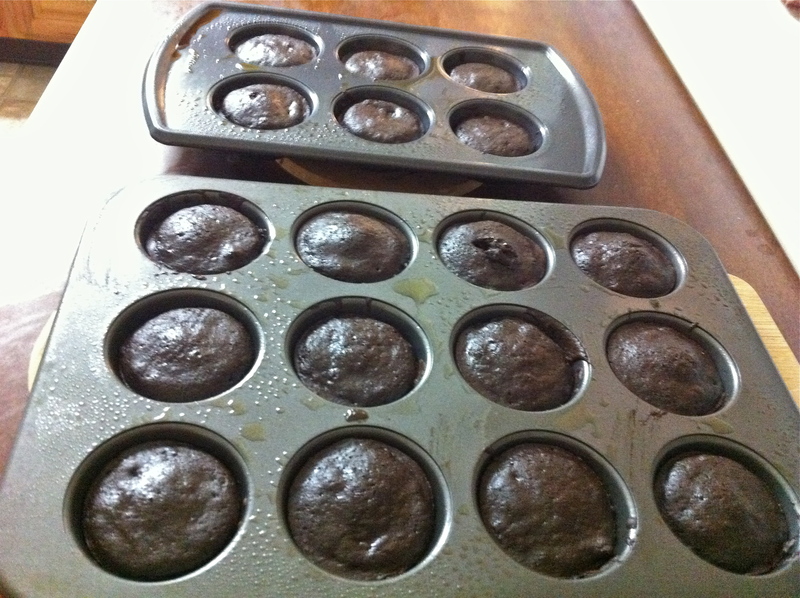 -Pour brownie mix, yogurt, instant coffee, water and vanilla into large bowl and mix together. 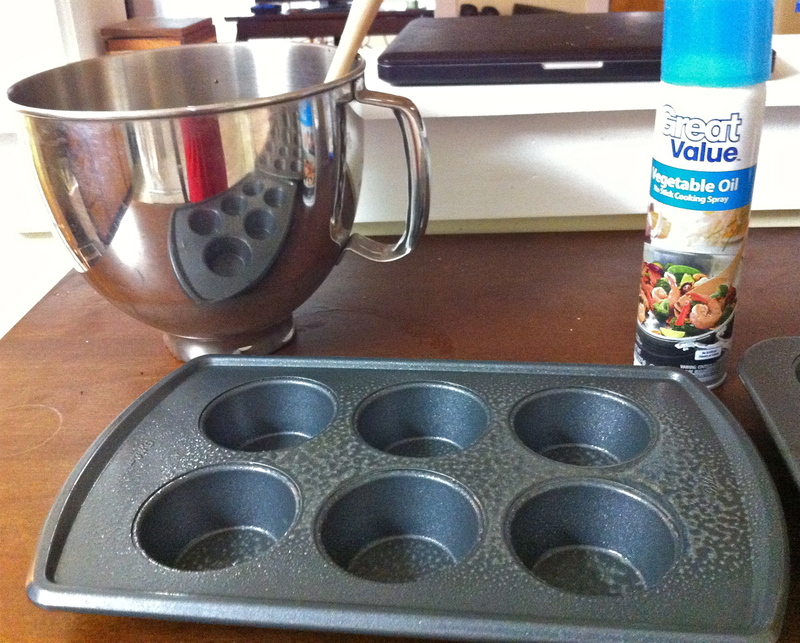 -Spray muffin tins with cooking spray. 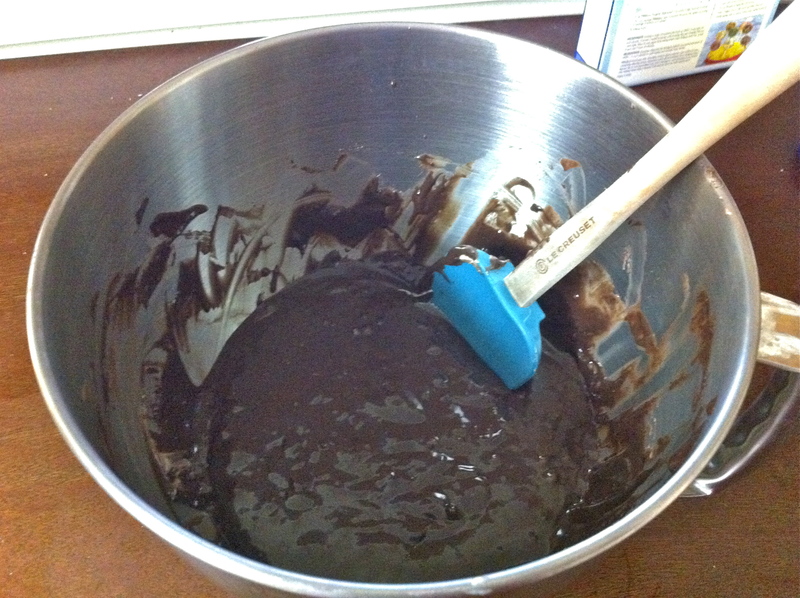 -Place small amount of brownie mix on bottom of tin about one spoonful; just enough to cover it. 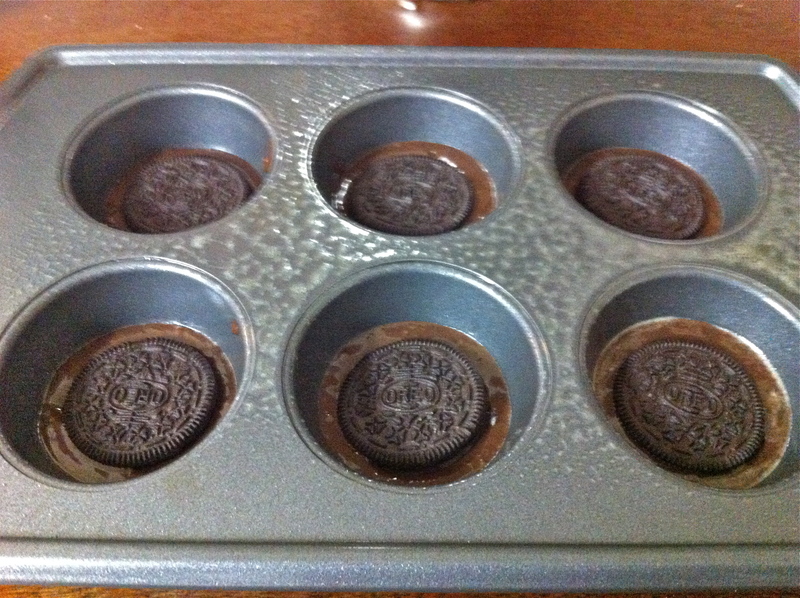 -Place whole oreo in bottom of each tin pressing it into the center of the cup. You can always do double stuffed oreos or more than one oreo for more crunch but it does add calories. One cake mix makes a batch of about 30 (not all pictured below). They are gooey chocolaty delicious with a hint of coffee and a great cookie crunch. The best thing is you can change it up. There are so many different flavors of Oreos these days peanut butter, strawberry smoothie, mint, to birthday cake. 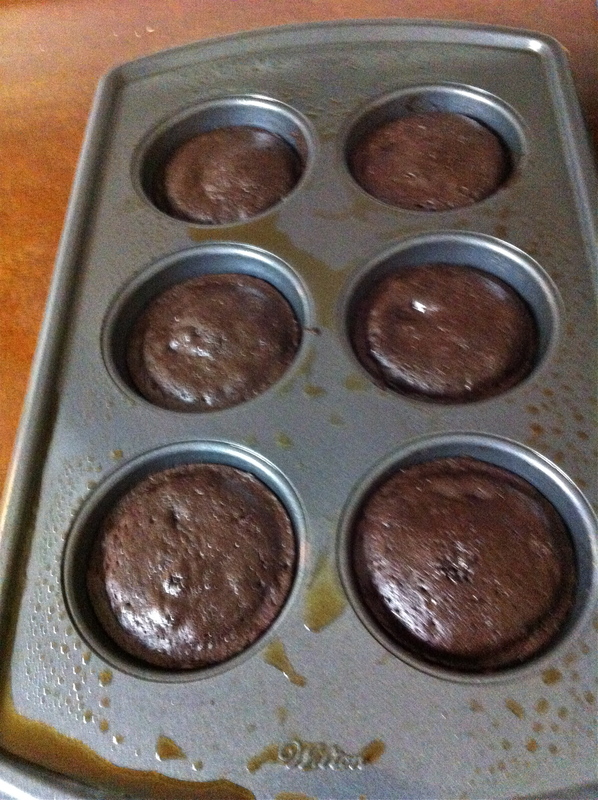 Take out the coffee or change up the brownie mix flavor. The options are endless. 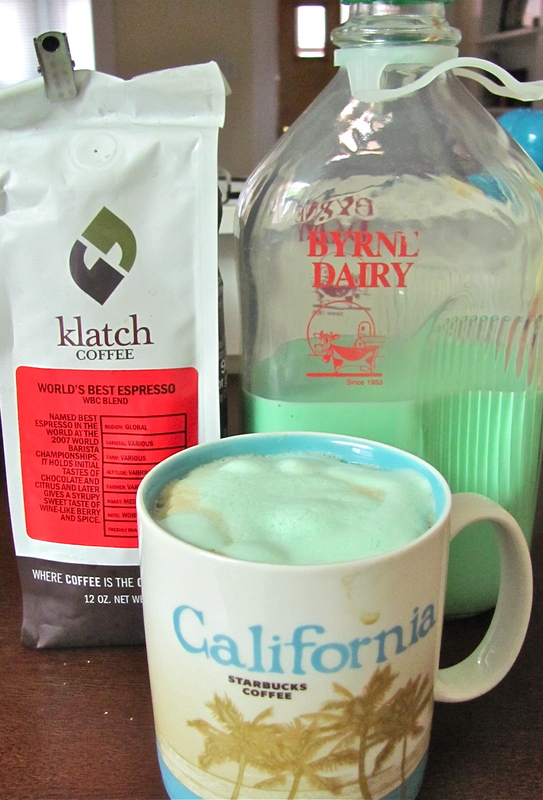 Irish Mint Milk in a glass bottle from the dairy down the street: it has made for some great lattes this weekend. 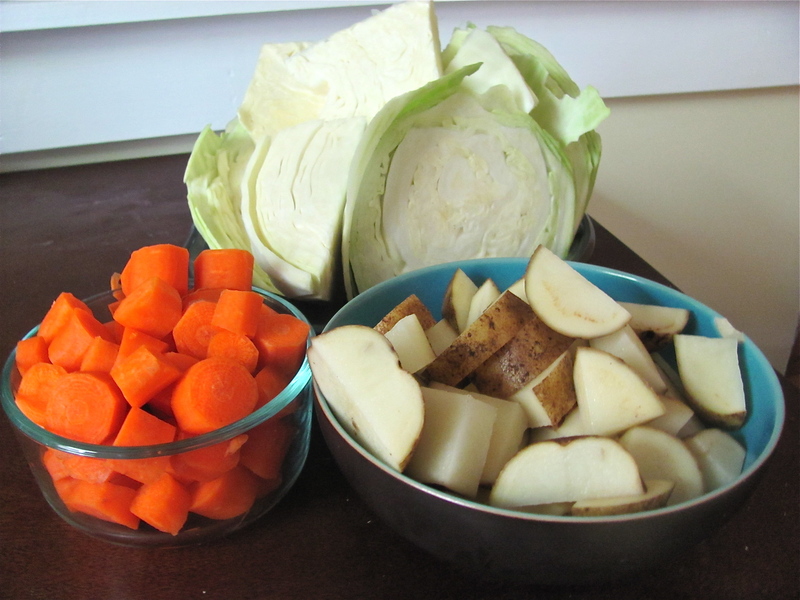 Veggies all prepped for the crock pot-can you guess what’s for dinner? 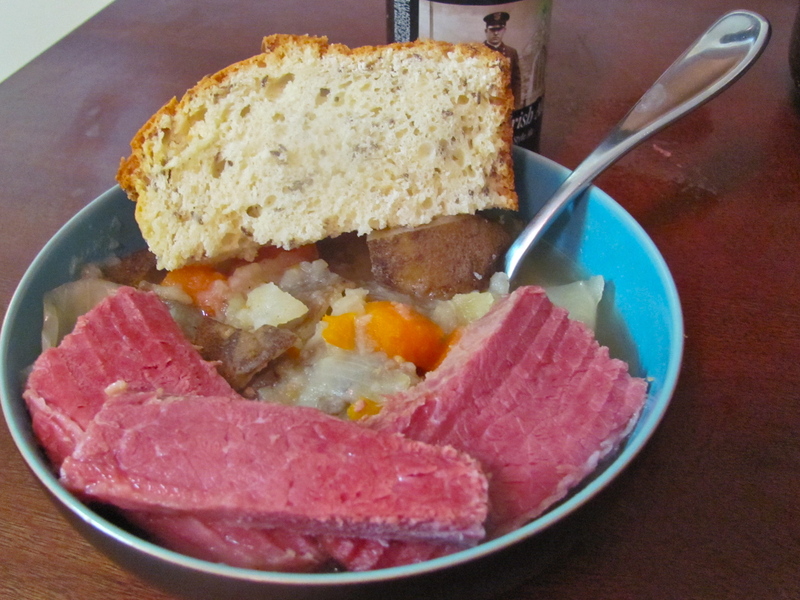 Homemade corn beef, cabbage and potatoes, and fresh baked irish soda bread= yummy! 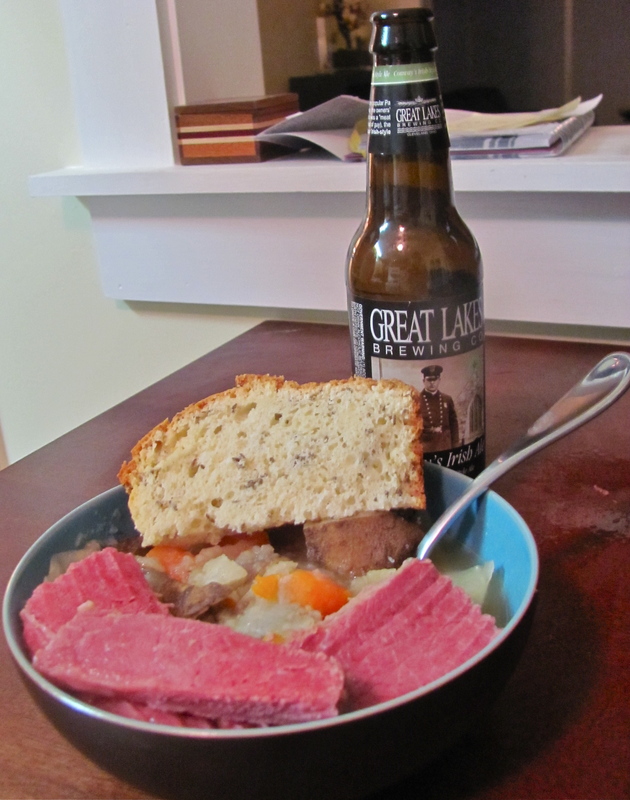 An Irish dinner isn’t complete without a good red ale (for Luke, I had hard cider). Hoping everyone has a great St. Patrick’s Day ! What are your plans to celebrate? I love coffee. I mean I went to college in Seattle what would you expect? But I like my drip coffee with a little liquid creamer in it. Not so much that you can’t tell it’s coffee anymore but enough so that it’s not black. Over the years I have bought every brand and flavor (minus hazelnut or amaretto- remember tree-nut allergy). 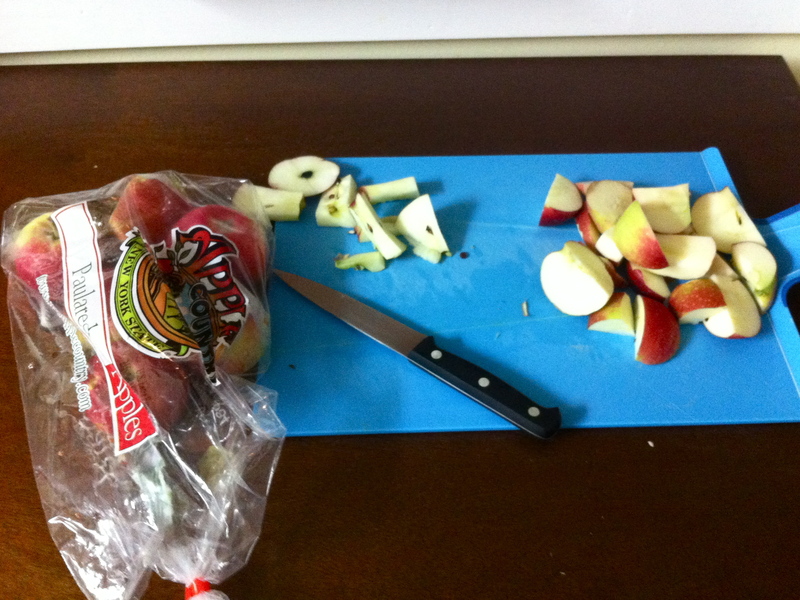 But once I got out of the all-nighter college haze I began to think clearer about health. I saw that a lot of creamers had ingredients I could not pronounce. And I began to question: Why? There has to be a simpler and more natural way. So then I started buying vanilla Coffeemate Natural Bliss. The ingredients stated online are milk, cream, and sugar (supposedly that simple). 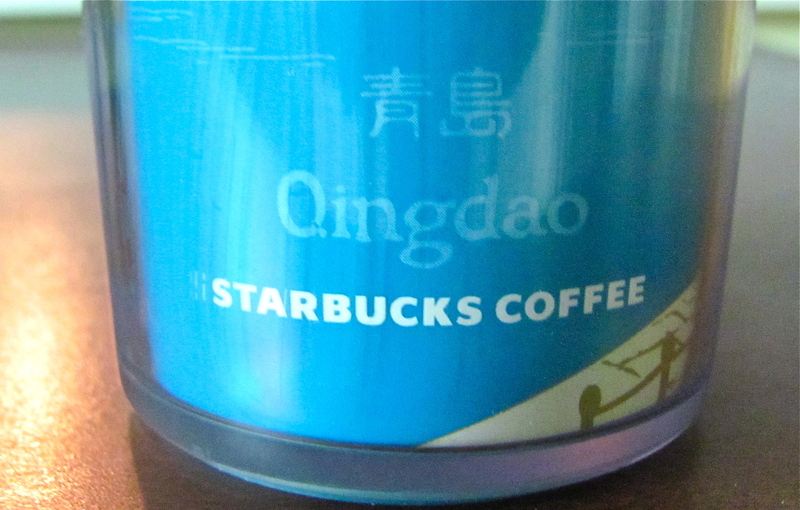 But it comes in a small container and it costs more then the fake stuff (go figure). Finally my husband asked me a very good question: “Why don’t you make your own coffee creamer? It will probably cost you a lot less”. So I did my research and have been making my own coffee creamer for the past 3 months. 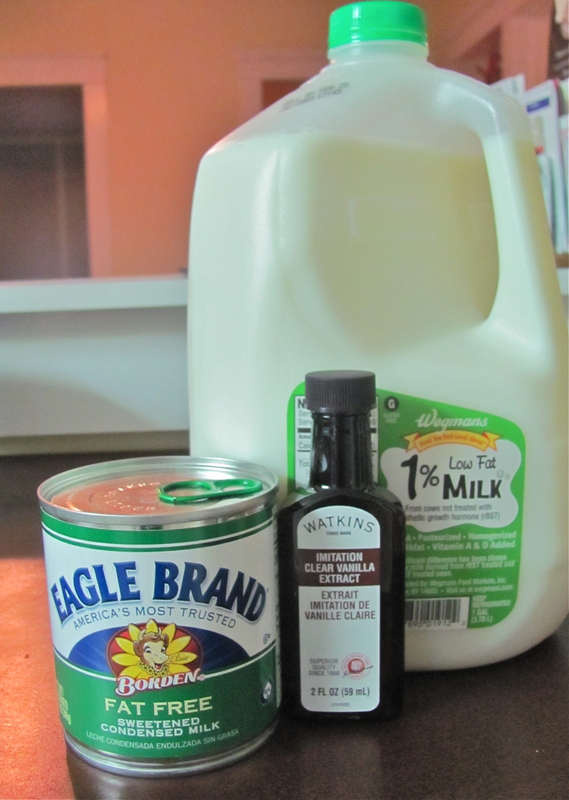 Here’s what I use: 1 % milk, Eagle Brand sweetened condensed milk (fat free), and a little vanilla extract. Usually I will use half a can of condensed milk, about 7 ounces, and mix it with 7 ounces of milk. But I will change this up. I can add a little cinnamon, cinnamon extract, ginger, peppermint extract, or canned pumpkin and pumpkin pie spice. 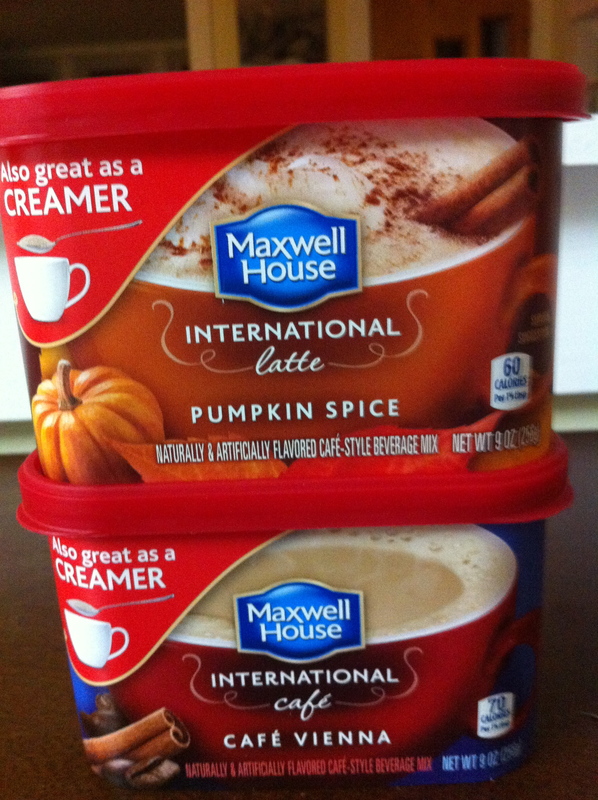 Then you have all you need to make your own pumpkin spice creamer, gingerbread latte, mocha, or peppermint mocha creamer. Just look at your spice rack or baking shelf and experiment! 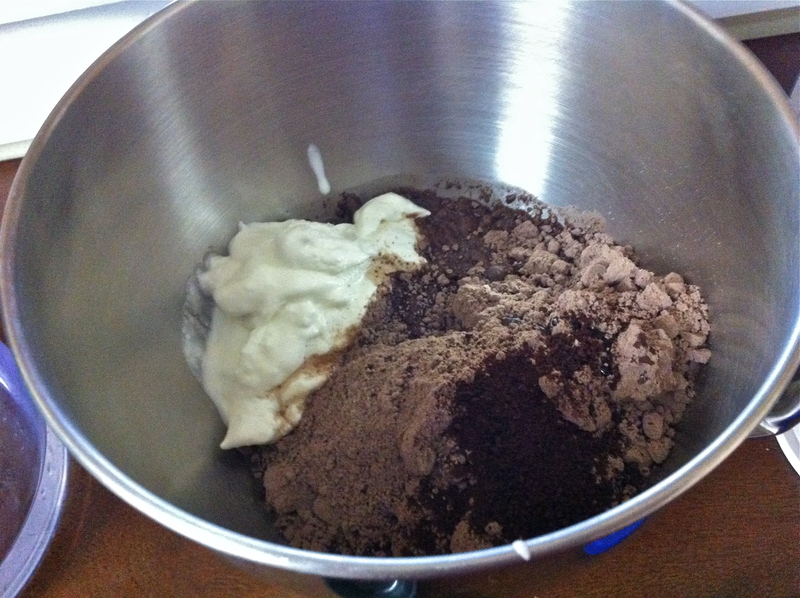 In going with the chocolate theme of the month, I added some cocoa powder to my creamer mix. 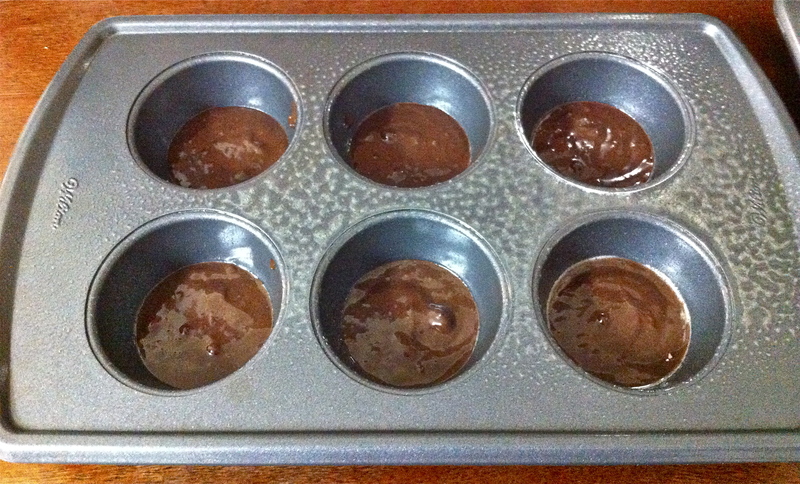 If you want to use cocoa powder heat up the powder with a little milk so it dissolves. 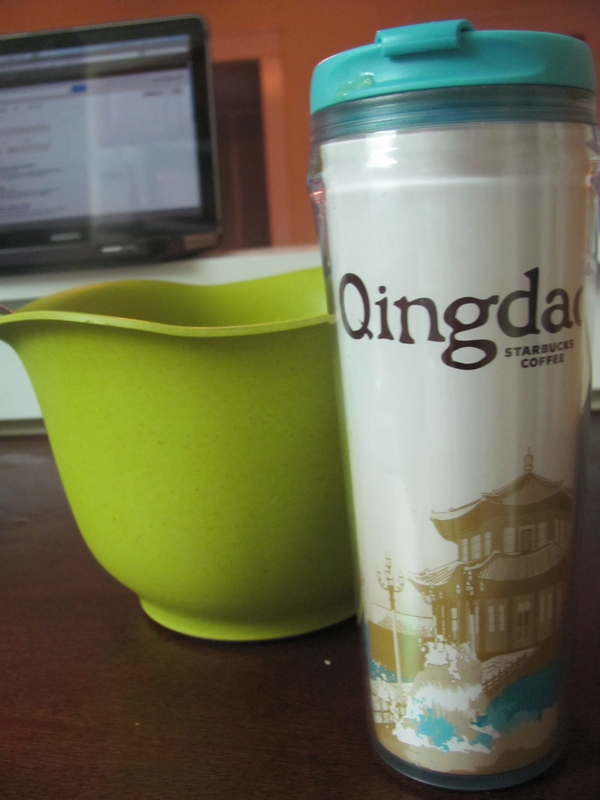 I store my coffee creamer in a to-go Starbucks cup giving to me by my brother and sister-in-law who live in China. It is a good reminder to pray for/ think about them. 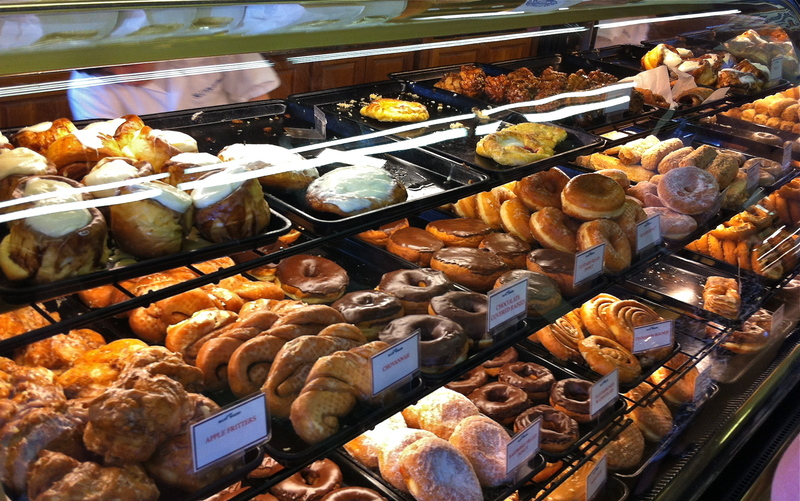 Do you use cream or sugar? Do you have a favorite coffee creamer or flavor? It’s funny what you think you’ll miss versus what you actually do. When I was eighteen away at college I missed my friends, my house, and my parents. But this is a whole different type of homesickness. I miss my old life. I had a very full life in SoCal. Not getting enough time to myself or with God.